Now that we know what this fall’s ballot will look like — i.e. cluttered with a passel of unnumbered, confusing and ill-conceived amendments to the North Carolina constitution — there is a simple path for caring and thinking people: vote “no” on all six. “So, our Honorables pulled themselves into special session yet again and gave the descriptions a makeover. The revised versions are less odious than the originals, but still bad. In regards to the courts, one amendment would set up a complex network with a “Nonpartisan Judicial Merit Commission” and several local merit boards to come up with nominees. In the end, however, for any vacancy, the governor could only pick from a list of two candidates — both chosen by the legislature. The other amendment left most of the governor’s appointment powers intact — except for the state ethics and elections board. Here, the governor would have to choose from a list again — this one drawn up by the party leaders in the legislature. Since those board members would be nominated by legislative honchos, it’s safe to say they’d be fierce and loyal partisans. Which means that almost any vexing political question before the “reformed” board would result in a 4-4 split. Which means that the results of any closely contested election would almost certainly wind up in the courts. Which (if the other amendment passes) would be staffed by loyal members of the majority party in the legislature. Cooper is right; this is still a bald, partisan power play that would weaken state government, leaving it more venal and more vulnerable to corruption. Regardless of which party holds the executive office, we need to preserve a legitimate balance of power in state government. That is why Republican former governors — including Pat McCrory, who’s not exactly a big fan of the current governor — spoke out. And that goes for the other four as well. 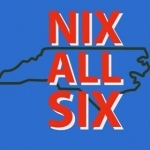 Where can I obtain “Nix all Six” yard signs?